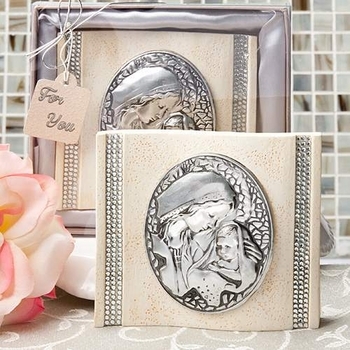 This beautiful religious party favor features the blessed Madonna and child. Perfect for Baptisms, Christenings and any other special occasion, these will be a cherished reminder of your child�s day. Each plaque is 4 inches wide, 4 inches tall and made of ivory toned poly stone with a striking wavy design. The Madonna and baby are cast from pewter metal with a vertical row of crystal clear rhinestone accents on each side. Comes in its own display gift box with satin underneath and a clear top. It is then wrapped in ribbon with an attached tag that reads "For You". You can also add Custom Personalized Tags or Stickers ($.35 each) if you would like to design and include your own special sentiment to each plaques' recipient.